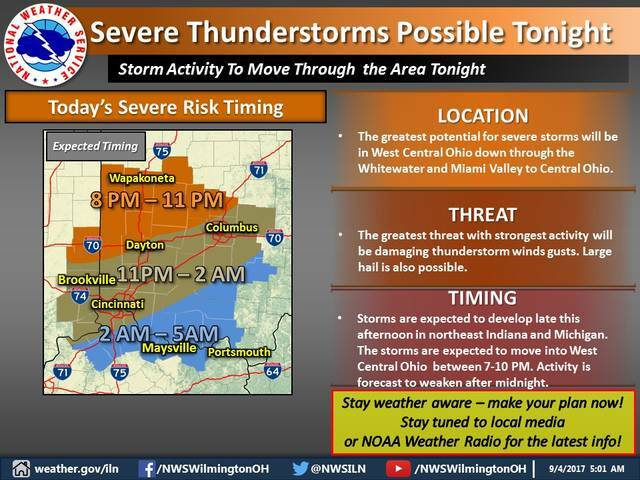 Strong to severe thunderstorms are possible tonight across central Ohio. The National Weather Service office at Wilmington has issued a hazardous weather outlook for the region, including southwestern and west-central Ohio, portions of eastern and southeastern Indiana, and northern Kentucky. According to the weather service, storms are expected to develop late this afternoon in Indiana and Michigan, and move into west-central Ohio between 7 p.m. and 10 p.m. today. Forecasters project the activity to weaken after midnight. Delaware County will be under the greatest threat for severe weather from 8 p.m. to 11 p.m. today. Forecasters said the main threat will be the potential for damaging wind gusts. Large hail is also possible. The official National Weather Service forecast for Delaware County is calling for a 90 percent chance of precipitation tonight, mainly before 1 a.m. One-half to three-quarters of an inch of rain is predicted. Winds will be out of the west between 9 and 16 mph. The low temperature tonight is projected to be 62 degrees. Tuesday’s forecast is calling for mostly cloud skies with a high near 73 degrees. Winds will once again come from the west, between 6 and 11 mph. For information, visit the National Weather Service’s Wilmington office online at www.weather.gov/iln. Follow the office on Facebook at www.facebook.com/NWSWilmingtonOH and twitter @NWSILN.